Chicago: University of Chicago Press, 1962. First Hardcover Edition. About Very Good/Good+. First hardcover edition, first printing. (Follows the paperback edition as a monograph in the International Encyclopedia of Unified Science. Also the first trade edition.) xv, , 172 pp. Publisher's blue cloth, spine lettered in metallic blue. About Very Good with foxing to spine cloth, two underlines and two marginal checkmarks to prelims, name written on front paste down, otherwise pages free of marks; slight wave to bottom of prelims. In unclipped original jacket with unfortunate sticker scar to spine panel, else Very Good: a little toned, spine panel slightly darkened, a few small stains, rubbed edges. Price intact ($4.00). 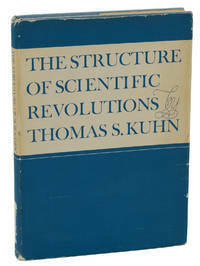 The scarce cloth issue of Kuhn's acclaimed history of science; even less common than the wrappered issue that preceded it. 1996-02-01. New. Ships with Tracking Number! INTERNATIONAL WORLDWIDE Shipping available. Buy with confidence, excellent customer service! 1970-09-09. New. Ships with Tracking Number! INTERNATIONAL WORLDWIDE Shipping available. Buy with confidence, excellent customer service! University of Chicago Press. PAPERBACK. 0226458121 Brand new book.Buy with confidence. Money Back Guarantee.Expedite Shipping Available. International shipment available. . New. 1970-01-06. New. Ships with Tracking Number! INTERNATIONAL WORLDWIDE Shipping available. Buy with confidence, excellent customer service! 1996-09-02. New. Ships with Tracking Number! INTERNATIONAL WORLDWIDE Shipping available. Buy with confidence, excellent customer service! University of Chicago Press. Hardcover. 0226458032 New Condition. . New. University of Chicago Press. Hardcover. 0226458032 Like New Condition. . Fine. University of Chicago Press. Hardcover. 0226458113 Like New Condition. . Fine. University of Chicago Press. Hardcover. 0226458113 New Condition. . New. 1970-09-09. Good. Ships with Tracking Number! INTERNATIONAL WORLDWIDE Shipping available. May not contain Access Codes or Supplements. May be ex-library. Shipping & Handling by region. Buy with confidence, excellent customer service! University of Chicago Press, 1996-12-15. 1. Hardcover. Used:Good. 2012-04-03. Good. Ships with Tracking Number! INTERNATIONAL WORLDWIDE Shipping available. May not contain Access Codes or Supplements. May be ex-library. Shipping & Handling by region. Buy with confidence, excellent customer service! Norwalk, CT: The Easton Press, 2000. Limited Edition. Octavo (23.75cm); full brown leather, with titling and decorations stamped in gilt on spine and covers; silk endpapers; all edges gilt; [xii],212pp. A Fine, unread copy. Norwalk, Conn.: Easton Press. New with no dust jacket. 2000. Hardcover. Brown full leather titled/decorated in gilt, all edges gilt, silk ribbon marker, moire endpages, raised spine bands. New in shrinkwrap in original box. Bookplate available on request. ; 8vo 8" - 9" tall . University of Chicago Press, 1970-04-01. 2nd Enlarged. Hardcover. Used:Good. University of Chicago Press. Hardcover. 0226458113 Special order direct from the distributor . New. 1970-01-06. Good. Ships with Tracking Number! INTERNATIONAL WORLDWIDE Shipping available. May not contain Access Codes or Supplements. May be ex-library. Shipping & Handling by region. Buy with confidence, excellent customer service! Chicago, IL & London: A Phoenix Book/Published by The Univeristy of Chicago Press, 1971. Enlarged 2nd Edition 3rd Impression. Trade Paperback. Good. 8vo or 8° (Medium Octavo): 7¾" x 9¾" tall. 210 pp. Solidly bound copy with moderate external wear and crisp pages. Stains on front cover. Water stains on bottom edge. Minimal pen markings on text. University of Chicago. PAPERBACK. 0608094293 New Condition. . New. University of Chicago Press. PAPERBACK. 0226458040 New Condition. . New. University of Chicago Press. PAPERBACK. 0226458083 New Condition. . New. Hardback. New. Challenges long-standing linear notions of scientific progress, arguing that transformative ideas don't arise from the day-to-day, gradual process of experimentation and data accumulation, but that revolutions in science, those breakthrough moments that disrupt accepted thinking and offer unanticipated ideas, occur outside of normal science. University of Chicago Press. Hardcover. 0226458113 Brand New ,Original Book , Direct from Source , Express 5-8 Business days worldwide Delivery. . New. Chicago: University of Chicago Press. Very Good+ in Good+ dust jacket. 1970. Second, enlarged. Hardback. 0226458032 . Red d/jkt, uncliupped; a little worn and marked; vertical split in front hinge. Orange boards, bright; binding tight. ; 8vo (6" x 9"); 210 pages . New American Library, January 1986. Hardcover. Used - Like New. Very nice faux leather green cover, in almost new condition. Chicago: The University of Chicago Press, 1962. Second edition, Enlarged.. Excellent, close to new condition. . Second edition, Enlarged. Chicago, The University of Chicago Press, 1962. 23 x 15,5 cm. XII, 210 pages. Original Softcover. Excellent, close to new condition. Includes for example the following chapters: Introduction: A Role for History / The Route to Normal Science / The Nature of Normal Science / Normal Science as Puzzle-solving / The Priority of Paradigms / Anormaly and the Emergence of Scientific Discoveries / Crisis and the Emergence of Scientific Theories / The Responce to Crisis / The Nature and Necessity of Scientific Revolutions / Revolutions as Changes of World View / The Invisibility of Revolutions / The Resolution of Revolutions / Progress through Revolutions / Postscript - 1969. Condition: Excellent, close to new condition. 1996-09-02. Good. Ships with Tracking Number! INTERNATIONAL WORLDWIDE Shipping available. May not contain Access Codes or Supplements. May be ex-library. Shipping & Handling by region. Buy with confidence, excellent customer service! University of Chicago Press. PAPERBACK. 0226458121 . New. 2014. CHICAGO. New. 8.6 x 5.75 cm. University of Chicago Press. PAPERBACK. 0226458083 Like New Condition. . Fine. University of Chicago Press. PAPERBACK. 0226458040 Like New Condition. . Fine. University of Chicago. PAPERBACK. 0608094293 Like New Condition. . Fine.